This NetEnt Jackpot, always patiently climbing up, will probably never hit the top 3 of largest iGaming Jackpots, but that doesn’t mean this online casino jackpot isn’t as hot as can be! Why? Simply because it’s more than a year ago the Arabian Nights™ Jackpot was hit! Way passed the 22 weeks that this NetEnt Jackpot usually needs to find a winner. That’s why! Oh, and besides, a €2.4 million jackpot might be rather attractive as well. With four pooled jackpots available, NetEnt created an impressive network of jackpots. The more NetEnt Casinos are offering the pooled jackpots powered by NetEnt, the faster they grow and the bigger the more millions are added. It is because of this brilliant jackpot strategy, progressive jackpots such as the Mega Fortune™ Jackpot, the Mega Fortune Dreams™ Jackpot, the Hall of Gods™ Jackpot, and the Arabian Nights™ Jackpot get the chance to grow sky high until won by a player. This is also why the pooled jackpot linked to the Mega Fortune™ slot is responsible for two of the biggest wins in the industry with an amazing €11,7 million won in September 2011 and a dazzling €17,8 million in January 2013. There have been 18 Arabian Nights™ Jackpot winners in total and all of them thought they would never win the Arabian Nights™ Jackpot. I’m going to give you a chance to increase the chance of winning such a jackpots as the status of the Arabian Nights™ Jackpot is HOT! Hotter than hot and the best way to explain why is by showing you some statistics. You can see that it has been a while before the last win as this was 1 year and 2 weeks ago. The average time the Arabian Nights™ Jackpot normally needs to find a winner is 21 weeks and 6 days. That’s less than a half year while a year has passed already. If this jackpot had feelings, it must be feeling like a balloon that can’t handle too much air anymore. In the year that no player at the NetEnt Casinos managed to win the Arabian Nights™ Jackpot, it managed to climb up to an incredible €2,394,710, a jackpot you can’t resist, especially when this hot! if you’re the next Arabian Nights™ Jackpot winner, winning over €2.4 million, you’ll beat the old record. With that, you’ll become the largest Arabian Nights™ Pooled Jackpot winner ever. Although, this jackpot is also offered as a local jackpot at some of the NetEnt Casinos which once resulted in a win of €8.6 million. 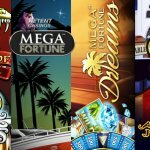 Without a doubt, Mega Fortune™, Mega Fortune Dreams™, and Hall of Gods™ are the most popular NetEnt Jackpot slots available at the NetEnt Casinos offering Mega Jackpots that are able to grow at least five times faster than the Arabian Nights™ Jackpot, but right now, the Arabian Nights™ Jackpot is the way to go! 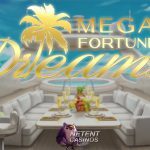 Your competition, will probably still be haunting the Mega Fortune (Dreams)™ Jackpots and this might be an advantage for you. Besides, all you need to do to win the Arabian Nights™ Jackpot is to hit five Wild symbols on an active bet line. If you do so, the staggering €2.4 million Arabian Nights™ Jackpot will be yours! Playing this 5-reel and 10 bet lines counting jackpot slot, you’ll be able enjoying a traditional Arabian night showing a camel, magic lamp and sword while the sound of crickets is giving the balmy Arabian night extra dimension. 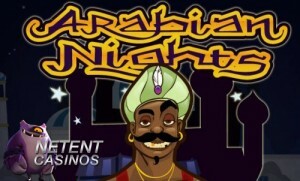 Enjoy a starry night on your quest for wealth with the Arabian Nights™ Jackpot as the main goal. 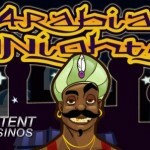 The Arabian Nights™ slot is one of those typical classic NetEnt slots. Modern already with a 5×3 layout, but traditional compared to the advanced video slots developed nowadays. That means that you can look forward to a Wild, Scatter and Free Spins without any further innovative slot features available. But what do you care if a €2.4 million is waiting for you? Just enjoy the simplicity the Arabian Nights™ slot is offering and some wishful thinking might end up in five Wilds on a winning bet line. If playing with the maximum bet, you’ll be the right owner of a €2.4 million jackpot which will be big news through the entire industry breaking the old record.